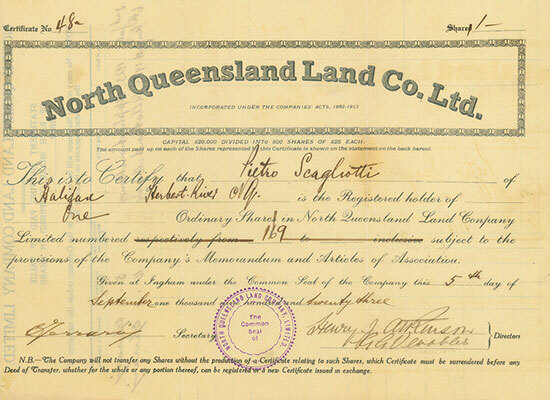 HWPH AG - Acciones antiguas - North Queensland Land Co. Ltd.
North Queensland Land Co. Ltd.
05.09.1923, 1 Ordinary Share of £ 25, #48, 19 x 26 cm, schwarz, braun, Knickfalten, 2 cm langer Einriss oben hinterklebt. Insgesamt standen nur 800 Aktien aus! 5 September 1923, 1 Ordinary Share of £ 25, #48, 19 x 26 cm, black, brown, folds, 2 cm tear on top, repaired with tape, only 800 shares were issued! Die Gesellschaft wurde am 11. Juli 1923 gegründet. Der Sitz der Gesellschaft befand sich in Townsville. The company was registered on 11 July 1923. The offices were at Townville.